New Year's Day Quake In Oklahoma City Amid Increasing Seismic Activity : The Two-Way The state of Oklahoma saw more than 800 earthquakes with magnitude of 3 or greater in 2015. 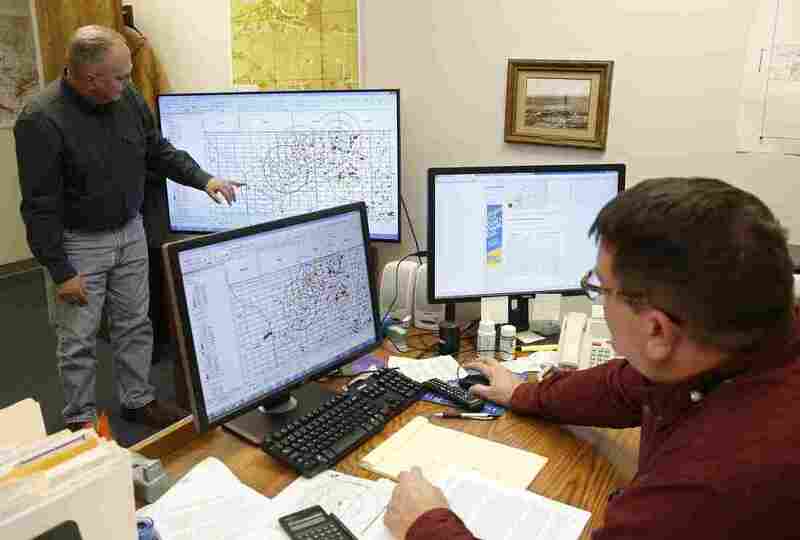 Charles Lord (left), senior hydrologist, explains the mapping procedure used by the Corporation Commission to chart fault lines, earthquakes and disposal wells, as Jim Marlatt, oil and gas specialist, looks on from his desk in Oklahoma City on Nov. 30. State regulators have taken steps to try to curb the number of quakes. Oklahoma City residents woke early New Year's Day to a magnitude 4.2 quake. Earlier this week, a magnitude 4.3 quake struck the same area. "If you think of a U.S. state associated with earthquakes, it's probably California. But really, you should think Oklahoma. In 2015, Oklahoma hit an all-time high, with more than 800 quakes of magnitude 3 or greater. That busts the record set in 2014, which topped the previous record set the year before. State officials have said this rise is very unlikely to represent a naturally occurring process. The concern is that these quakes may be linked to oil and gas drilling — specifically, the way wastewater produced by the drilling is pumped into deep underground disposal wells. Oklahoma is trying to address the issue. It has a coordinating council on seismic activity that includes regulators, scientists and industry representatives." "Oil and gas production creates a lot of toxic wastewater. To keep it from contaminating drinking water, oil companies inject the fluid into underground disposal wells. That can put pressure on faults, causing them to slip, which scientists say is responsible for Oklahoma's massive earthquake spike." And even as scientists blame the oil and gas industry for the new seismic activity, "researchers say the earthquakes could compromise the economically vital energy hub." StateImpact says the National Research Council advises "investigating any potential site's history of earthquakes and its proximity to fault lines." Other scientists suggest "that companies look for new ways of disposing of wastewater altogether."